All I need is my pup. 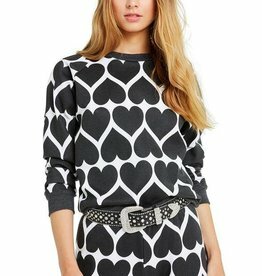 The Sommers Sweater is a vintage inspired sweatshirt with raglan sleeves, a crew neck, and banded hems. In our super soft heather burnout blend. Flocked graphic. 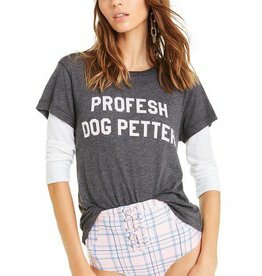 Crazy dog lady. 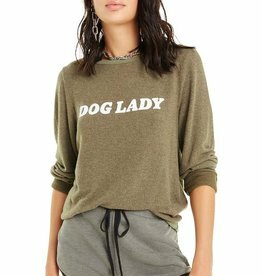 The Dog Lady Baggy Beach Jumper is a relaxed, slightly oversized pullover that hangs off the body perfectly. 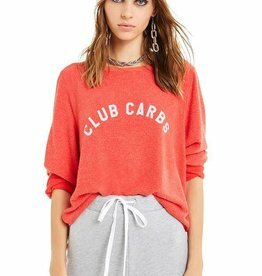 Featuring a scoop neck and banded hems. 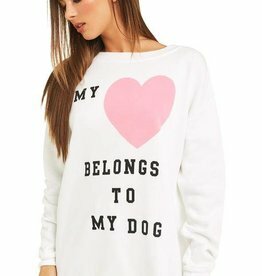 In Wildfox's deliciously soft Vintage Varsity fabric. The Romeo V-Neck is a relaxed tee with a roomy fit. In lightweight tissue jersey. 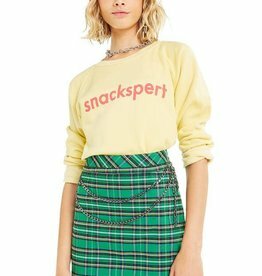 Featuring a scoop neck and slight cropped length. Who's Hangry? The Sandwich Manchester Tee is a Relaxed scoop neck t-shirt in a super soft to the touch feel, tissue jersey. Slightly oversized with a loose and roomy fit. Sorry, I can't tonight. I have plans with my dog. 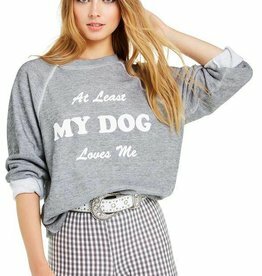 The Dog Mom Sommers Sweater is a vintage inspired sweatshirt with raglan sleeves, a crew neck, and banded hems. In our super soft sherpa fleece. 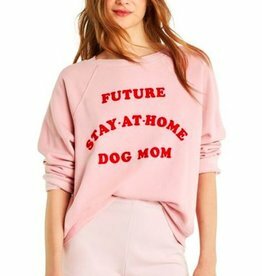 Featuring "Future Stay at Home Dog Mom" written in flocking. Get lost. The Tropic Camo No9 Tee is a vintage inspired shrunken tee with a crew neck and slightly cropped fit. In Wildfox's sublimated tissue jersey. With a side of ranch. 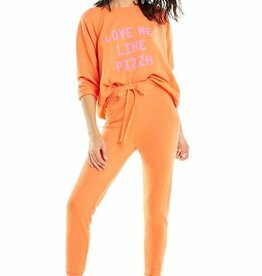 The Love Me Like Pizza Sommers Sweater is a vintage inspired sweatshirt with raglan sleeves, a crew neck, and banded hems. In our light terry. Pairs with the Jack Jogger in Flame. The Johnny Ringer tee is a vintage inspired shrunken ringer tee with a crew neck, slightly cropped fit and contrasting neckline and sleeve piping. In our lightweight tissue jersey. If you don't like tacos I'm nacho type. 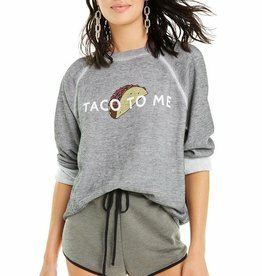 The Taco to Me Sommers Sweater is a vintage inspired sweatshirt with raglan sleeves, a crew neck, and banded hems. 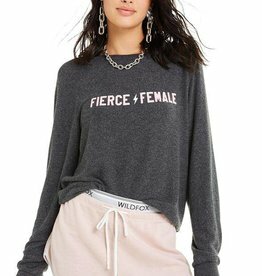 In Wildfox's super soft heather burnout blend. Be the best version of you. 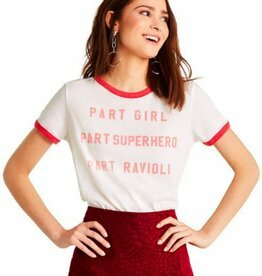 The Part Ravioli Johnny Ringer tee is a vintage inspired shrunken ringer tee with a crew neck, slightly cropped fit and contrasting neckline and sleeve piping. In our lightweight tissue jersey.